New Item I will introduce Electric reel !!! I will sell new electric reel in about a week. It is very powerful and high quality! So,please wait for a while!!! Leobritz brands are very rare outside Japan. We want to sell Leobritz electric reels to many global customers. Please wait for a while! Please send the picures of your fishing!!! I like watching the picures of fishing! I appreciate many customers send the fishing picture! And I am looking forward to your fishing pictures. Electric reel, spinning reel, baitreel, lod, lure..
DAIWA TANACOM bull 1000 Fe Sales !!! DAIWA TANACOM bull 1000 Fe. Very nice and high quality!!! We recommend this reel very much!! Shimano Dendou Maru 3000 Beast Master MUTEKI We start selling!!! We sell Shimano Dendou Maru 3000 Beast Master MUTEKI from this week. For big and deep fishing, Miyamae's Miyaepoch is the best electric reel. Miyaepoch is very popular amang pro fisherman too. Miyamae released new electric reel called "MiyaEpoch AC5S" in 2011. This MiyaEpoch AC5S is for light deep fishing. Please check the URL below. I will introduce new electric reels. We will sell those items from the beginning of next week. Please wait for a while!!!! Please ask me!!! About fishing items!!! If you are looking for the fishing items which we don't sell at our website,please contact me. After you ask me some items, we will check and answer very soon!! 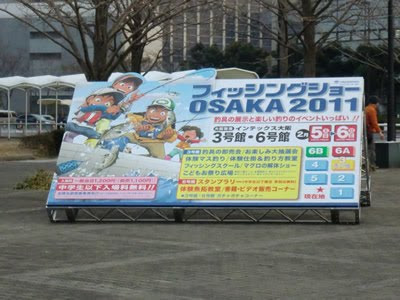 Our comany is located at Osaka in Japan. There are many big comanies at osaka. Shimano head office is located at Osaka. Yuriko report Osaka Fishing show on Feb.2011. Daiwa released new model of poweful electric reel LEOBRITZ series 3models. Small size bul wevy powerful! MegaTwin power gives you allow to use for Squid and bluefish. For big and deep fishing! This winter season,it is very cold very mucn in JAPAN. Yesterday, it snowed very much. Next time, I expierience the snow . I take the pictures and introduce it!!! New Japanese electric reel ! please wait for a while. We will introduce new electric reel at our website this week. I am very busy because many customers buy our items. Every day , many customers send the fishing pictures to us. I am very happy to see the pictures. I introduce some pictures at this blog and website. I like fishing and talking about fishing & fish! We will sell some popular new items at website. I will write these items at this blog next week. buy many items every day! We started electric reel website about one year ago. Every day , many customers buy our fishing products. I appreciate our customers very much. And my dream is to meet our customers all over the world. Nowadays,there are many Sushi restaurants at many restaurants. Of course,sushi is origin of Japan. Most Japanese people like eating Sushi. I eat sushi over one time every month! 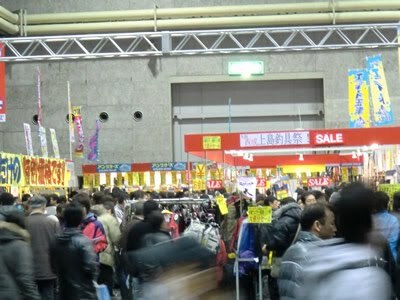 Fishing Show Osaka 2011 so many people! I and Akira went to Fishing Show Osaka 2011 in Intex-Osaka. There are lot of new products from each fishing suppliers. But Akira sell fishing products two days to customers, he sold more than 20 electric reels! This fishing show has other booth which sell bargen priced fishing products to customers. See so many people around stores. Check out SHIMANO 2010 New Model Electric reel Dendoumaru9000 Beast Master ZB ! This electric reel has ultimate power & speed. It is Fine day in Osaka. This year it is very cold in Japan. Is snowed very much at many areas in Japan. At the end of next month, it will be spring season in Japan. By the way, fishing show will start tommorow. It's big event of fishing items. Nowadays,many european customers buy our reel! Shimano&Daiwa reels are high quality reels.